2 March, British government lands troops in Delagoa Bay. Construction begins on the building of Fort Frederick. 25 April, Proclamation issued creating the District of Uitenhage. In September the farm of the widow Scheepers was chosen as the site for the new administrative village. 14 February, Captain Jacob Cuyler appointed commander of Fort Frederick and provisional landdrost of Uitenhage. November, The farm Strandfontein provisionally granted to Piet Retief. This was but one of the farms acquired by Retief at a time when he planned to establish himself as a government contractor, supplying beef to the troops. Main Street is laid out. 10 April, Arrival of the Chapman in Algoa Bay, which brings the first English settlers to the Eastern Cape. This was followed by the ships Nautilus on April 14, Ocean on April 15, Kinnersley Castle on April 29 and Northampton on April 30. 6 June, Arrival of Cape Governor, Sir Rufane Donkin, to supervise the settlement of British immigrants. On this day the new town was named Port Elizabeth in honour of his late wife. The Hill, North End and South End are laid out. 4 June, Frederick Korsten granted a piece of land on the beach adjoining Strandfontein for the establishment of a whale fishery. October, A plot of land located on Main Street was granted to Nikolaas Hitge “to build an inn which might prove a decoration to the town”. The Red Lion Hotel was subsequently taken over in 1823 by the government to house a custom house and public offices. The site is currently occupied by Woolworths. 1 October, William Dunn appointed Customs Officer and in January 1822 became the town’s first postmaster. A census of the town indicates that its population consists of 73 men, 30 women, 44 boys and 33 girls. The figures exclude the 75 KhoiKhoi employed by the residents and the 64 slaves they also owned. Port Elizabeth declared a separate magisterial district, until 6 February 1832 when it was included in the district of Uitenhage. London Missionary Society settlement established. January, Port Elizabeth prepares its defences against a possible attack from Xhosa warriors. The attackers eventually turn back before reaching Uitenhage. 6 February, Port Elizabeth again creates a separate magisterial district. 20 June, Victoria accedes to the English throne. March, Catholic mission founded in Port Elizabeth by Bishop Raymond Griffith. 10 April, Foundation stone laid for the first jetty. April, David Livingstone arrives in Port Elizabeth and begins preparations for his journey inland. November, German, born Joseph Mosenthal establishes the merchant firm of Mosenthals in Port Elizabeth. 6 January, The sailing ship Margaret Hardy arrives in Algoa Bay, bringing the first of a new contingent of settlers from England. 7 May, The first issue of the Eastern Province Herald is printed. February, The Cape government decides to move all lepers and paupers in the colony to Robben Island. A group of 16 lepers and 13 destitute persons from Port Elizabeth are transported there by the cutter Isaac. April, Artist Frederick I’Ons visits Port Elizabeth. 9 November, The first strike recorded in the Cape takes place when a group of Mfengu beach labourers lay down tools and demand higher wages. In June 1852 they again go on strike, following the proclamation of a new town regulation which requires them to wear clothing while at work. 8 February, Meeting of citizens adopt a set of municipal regulations and forward them to the government in Cape Town. 12 May, The first public concert to be held in Port Elizabeth raises GBP 50 in aid of famine victims in Ireland and Scotland. 18 November, New municipal regulations for Port Elizabeth are promulgated by the Governor, Sir Henry Pottinger. February, Artist Thomas Baines visits Port Elizabeth. He returns to the town several times making copious sketches and paintings. 7 September, The first issue of the Port Elizabeth Telegraph is printed. In February 1898 it is renamed The Cape Daily Telegraph and ceases publication in December 1908. 2 October, The Port Elizabeth Public Library and Reading Room open an inner room in the Commercial Hall with 154 members. January, The first Chinese residents of Port Elizabeth arrive on the Norfolk. Additional settlers from China are known to have reached Algoa Bay in November 1881 and December 1883, whilst additional Chinese refugees from the war in the Transvaal arrive in Port Elizabeth in October and November 1899. 19 May, Meeting held at the Commercial Hall to protest the proposed transport of English convicts to the Cape. August, Plans laid for the reclamation of land north of Jetty Street subsequently known as the Victoria Quay. 5 March, First issue of The Mercury published. 1 April, Commissioning of Cape Recife lighthouse. 1 December, Commissioning of a lighthouse on Bird Island. November, The Commercial Bank of Port Elizabeth publishes its prospectus. 1 September, Issue of the Cape’s first postal adhesives. Designed by Surveyor, General Charles Bell, they subsequently become known as the Cape Triangulars. The suburb of Korsten is established. 1 July, First assembly of the Cape government held in Cape Town. Construction begins on the Grace Street Mosque, better known as Masjied, ul, Akbar. The necessary funds are donated by the Sultan of Turkey. The Muslim community of the Eastern Cape is said to have been descended from a number of Moslems who left Cape Town in 1806 to settle in Uitenhage. 27 June, Governor Sir George Gray grants land at the top of Hyman’s Kloof for the establishment of a “Stranger's Location where Hottentots, Fingos, (Xhosa) and other strangers visiting Port Elizabeth may temporarily reside”. Following the Land War of 1851 Mfengu were allowed to settle in the Colony and therefore did not require passes. A number of these moved to Port Elizabeth where they found work on the beach landing loading cargo onto and from surf boats, work which had previously been performed by Khoi. The resultant wages were usually set aside for the purchase of cattle. In 1815 the farm Welbedacht is granted to AM Muller. Located to the south, west of Port Elizabeth it covered an area just under 14 square miles. When Muller died in 1845 his farm was inherited by his 8 sons who, true to form, could not decide on how to sub, divide the property. As a result the farm was sold and the money was distributed to the heirs. In 1855 the area was transferred to the municipality of Port Elizabeth and renamed Walmer in honour of the Duke of Wellington. The area was then laid out and on 8 March 1855 it was resolved to sell 400 plots by public auction. A number of stands were also reserved for the Dutch Reformed Church and the Anglican Church. The village plan included wide streets and a plentiful supply of water. By June 200 plots had been sold. In 1899, Walmer was awarded separate municipal status while its residential character, spacious residential plots and attractive dwellings attracted both families with young children and the elderly. 17 January, The foundation stone of the Grey Institute is laid on a public holiday commemorating the fall of Sebastopol in the Crimean War. 4 June, An Act is passed creating the Port Elizabeth Divisional Council. 10 September, A hospital is opened in Rodney Street. The residential township of Walmer is laid out as a separate municipal entity. 3 June, A provisional committee is established to draft a prospectus for a new bank to be called the Standard Bank of Port Elizabeth. July, Arrival of Aurifera in Algoa Bay with the first of 32 contingents of immigrants. This third wave of immigration is to last until 1867. 18 October, Foundation stone of the Town Hall is laid by the Governor, Sir George Grey. This is completed in 1861. The porch is added in August 1865 and the Clock Tower in 1884. In 1877 the building is destroyed by fire and is later restored and reopened for use on 19 November 1981. The first canteens in South End are licensed. 6 August, Prince Alfred, second son of Queen Victoria, visits Port Elizabeth. 1 January, The borough of Port Elizabeth officially comes into existence. 21 January, The first pillar box is erected in Port Elizabeth. 1 June, A market is opened at North End in the new Market Square as an extension to the main market. On that same day the lighthouse on the Donkin Reserve is brought into use. 6 August, St George's Park is laid out on the site of a previous dam. 14 October, North End Grey School is opened in temporary premises. 24 May, A newspaper report states that the old game of football is to be played in front of the Grey Institute. September, The Port Elizabeth Hebrew Congregation is formed in a house in Queen Street which is hired and fitted out as a synagogue. 1 September, The Port Elizabeth Gas Company is formed. 14 January, Land for a new public cemetery at North End is set aside by the municipality although the first burials do not take place there until the 1880s. A portion is set aside for a Jewish cemetery. 13 February, the Port Elizabeth Agricultural Society holds its first show. The first Cape Census is conducted. 1 June, A second mosque is built in Strand Street next to the beach in an area predominantly inhabited by Malay fishermen. Its first Imam is Aboo Rafie. The narrow site is sold in 1900 on behalf of the Muslim community and the mosque is demolished the following year. 22 April, The last public execution in Port Elizabeth takes place on the green before the North End jail. Discovery of diamonds in the Northern Cape. January, Construction begins on the North End jetty. May, The Port Elizabeth and Uitenhage Railway Company is formed. 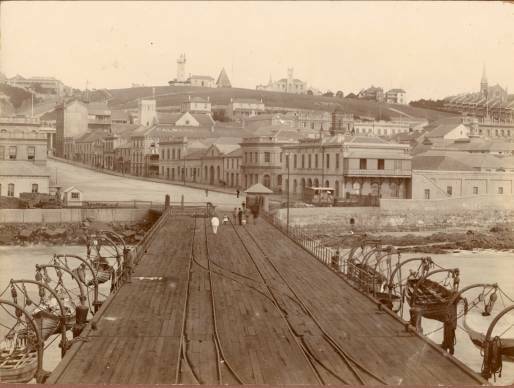 The link to Uitenhage is opened on 21 September 1875. February, The Collegiate School for Girls is opened with Miss Virginia Isitt as its first principal. 5 November, The Town Council imports equipment for the watering of the streets which were at that stage unsurfaced. October, The South End Grey School is opened in temporary premises. 17 April, Foundation stone of the Western Road Synagogue is laid. Its design is based upon a similar building in Berlin. 20 May, The Steam Laundry Company opens for business. The gradual filling in of kloofs in the immediate vicinity of Port Elizabeth removes what had been the washing places used by local laundry women. July, Bethelsdorp is formally surveyed in January 1879 and in 1878 legal title to the land is first given. Garden plots next to the Chatty River which subsequently become known as Kleinskool and Veeplaas are also made available, as well as plots alongside the salt pan at Missionvale. 11 September, The Port Elizabeth Tramway Company is established although the first horse, drawn trams only begin operation on 14 May 1881. Kleinschool, Veeplaas and Missionvale are laid out. April, The new iron pile North Jetty is almost complete. 9 April, The foundation stone of a new Wesleyan Chapel for Black residents is laid in Edward Street. It is opened on 19 February 1882. Peak of first ostrich boom in Oudtshoorn. 17 February, The Prince Alfred’s Guard Drill Hall is opened with a grand ball to mark the occasion. 1 May, The first telephone exchange in South Africa is installed in the Post Office at the corner of Main and Jetty Streets. Initially it has 44 subscribers. The automatic exchange is opened in 1932. 9 September, New lazaretto opens on the south side of the Shark River. It is replaced in September 1894 when a new building is erected on the site of the present Elizabeth Donkin Hospital. 16 October, Electric powered lighting is shown in Port Elizabeth for the first time in South Africa. July, Work on the construction of the South Jetty is completed. 2 February, The first sale of ostrich feathers takes place in the new Feathermarket Hall. The new market buildings including the Feathermarket are officially opened on 10 December. 12 August, John Pyott advertises the closure of his grocery business to concentrate solely on the baking of his biscuits. 12 March, The first cricket test match played in South Africa takes place on the Port Elizabeth Cricket Club grounds. 16 October, The Advertiser reports that a Malay cricket tournament is to be held in Cape Town as well as at the local Star of the East Club. 13 December, The Town Council agrees to allow the government to expropriate a large area of land between Strand Street and the railway lines in order to extend railway premises. This involves the demolition of a number of old buildings and areas considered to be “slums”. 30 July, The first rugby test played in South Africa takes place at the Crusader Grounds when a South African side plays a British team. 4 September, Plans were put forward for the construction of a mosque in Rudolph Street named the Masjied, ul, Abraar. This replaced the old South End Mosque. 9 March, St Mary’s Church is destroyed by fire. A new structure is consecrated on 13 September 1896. 3 December, The Gamtoos River bridge is opened to replace the ferry. Town Council agrees to the construction of a road to Walmer through Target Kloof. 17 June, Samuel Clemens, better known as Mark Twain, visits Port Elizabeth. 26 July, The new Athenaeum is opened. 22 April, Walmer is established as a separate municipality. It becomes part of Port Elizabeth in 1966. 1 October, The first refugees from the South African War arrive in Port Elizabeth and are housed at the Agricultural Society’s showgrounds. They are later moved to the Fairview Racecourse as well as Prince Alfred’s Park. These settlements are eventually abandoned in May 1901. 25 June, Opening of the new Post Office building. The adjoining telephone exchange is built in 1919. 22 January, Death of Queen Victoria. 13 April, Rats infected by bubonic plague are found in mielie [corn] stacks on Harbour Board property. A Plague Board is formed on 23 April and the first victim in town is Sergeant Pegg, who had worked on the military stores depositing ground. He dies at the base hospital on 20 May. 27 July, Opening of the Pier Street Mosque, better known as Masjied, ul, Aziz. Its first Imam is Abdul Wahab Salie. 10 October, Martial law is proclaimed in Port Elizabeth. It is repealed on 17 September 1902. New public library is opened in ornate Gothic revivalist building opposite City Hall. 4 August, Port Elizabeth is officially declared free of plague. During this time 136 cases of the disease are recorded, 57 of them fatal. 8 May, Opening of the Shri Siva Subramanier Aulayam Temple in Upper Valley Road to serve the spiritual needs of Port Elizabeth’s Tamil community. Another temple, the Shri Mariamman is built in South End in 1912. The Tamil community are thought to have originated from Mauritius, and originally work mainly as fruit growers and general dealers. However a number of the Tamil community are also employed in various capacities in Port Elizabeth hotels. 11 February, Horse Memorial is unveiled. 18 April, Official opening of the Van Staden’s River Railway Bridge. 28 June, Work begins on the Mount Road Power Station on a portion of the old agricultural showgrounds. It comes on line on 1 May 1906 when Mayor Alexander Fettes switches on the first street lamps. The first Power Station is replaced by a new building in 1924. Opening of narrow gauge railway line linking Humewood Station to Humansdorp. The line from Port Elizabeth reaches Avontuur on 5 December 1906. Fairview and Newton Park are laid out. 11 December, Consecration of the Rally Street Synagogue. Peak of second ostrich boom in the Albany. 28 July, Port Elizabeth is declared a city. 10 November, The Humphries Street mosque, better known as the Masjiedun Nabawi is completed. 28 August, Work begins in Russell Road to introduce a sewage removal system to the city thus phasing out the old bucket system. 21 February, The troop ship SS Mende collides with the Darrow off the Isle of Wight whilst travelling in a heavy fog. As a result 625 men of the volunteer SA Native Contingent, drown. Some of these men came from the Eastern Cape and a memorial is erected in New Brighton in their honour. 5 October 5, Outbreak of the Spanish influenza epidemic. Altogether 139 471 people die in South Africa of which 1123 are people from Port Elizabeth. 11 November 11, The armistice is declared in Europe, bringing to an end the First World War. Parliament passes the Union Housing Act. 21 January, A delegation of Black workers meets with employers at the City Hall to decide on an increase in wages. 23 October, The Coloured and Native Workers Union under the leadership of Masabalala threaten to strike over higher wages. During the course of a meeting held in Korsten, a visiting speaker, Dr Rabusana, is attacked by a hostile crowd. Masabalala and the Secretary of the Union are arrested and taken to the Baakens Street Police Station. As a result, their supporters begin to gather in Market Square and, armed with sticks and kerries, demand their release by 17h00. When this did not take place, and after a number of unsuccessful attempts were made by the police to disperse the crowd, protesters attempt to storm the doors of the police station. In the melee a shot is allegedly fired at the police, who then respond by killing 24 people, including a number of innocent bystanders. Later that day attempts are made to attack the Power Station and the Mitchell Cotts petrol store. 9 April, The foundation stone of the campanile [bell tower] is laid. Parliament passes the Union Natives (Urban Areas) Act. May, The Dowerville housing scheme for municipal coloured employees is completed. 14 July, The foundation stone of the Korsten village hall is laid. September, Horse, drawn fire tenders are replaced by motor fire engines and fire escape ladders. November, The Ford Motor Company opens its factory and by February 1924 had produced its first Model T, which was also the first in South Africa. Thereafter an average of 10 cars a day are assembled. In October 1930 a new factory is opened in Harrower Road and in 1948 its operations move to Neave Township. August, The location for a new Black township of Walmer is approved, including what was called the Old Municipal Camp. October, Fairview Primary School starts with 41 pupils. By October 1937 it has 167. Establishment of the first motorcar assembly plant in South Africa. Act No 11 of 1924 gives legal recognition to trade unions. Despite this, by 1921 a number of unions are already active in Port Elizabeth including the Engineers, Commercial Workers, Furniture Workers, Leatherworkers, Postmen, Carpenters and Joiners, Tramwaymen, Tailors, Ostrich Feather Sorters, Building Workers, the SA Typographical Union and the Industrial and Commercial Coloured and Native (Amalgamated) Workers Unions. 26 January, The first Black secondary school in Port Elizabeth is opened at Paterson. 31 January, The Port Elizabeth telephone exchange is changed over to an automatic system. February, Mrs. Duncan Anderson becomes the first woman City Councillor. February, General Motors establishes a factory in Darling Street where 45 cars could be assembled daily. The first Chevrolet is assembled on 1 July 1927 and in October 1928 the company begins plans to move to new premises in Kempston Road. 21 September, Water restrictions are introduced to Port Elizabeth. The growth of the town, coupled with regional droughts places a great strain on its water resources, and the situation is not resolved until the completion of the Kromme River Scheme. January, Municipal housing scheme is begun in Kent Road. By the time it is completed in March 1928, 30 houses have been delivered. June, A coloured municipal housing scheme, previously begun in South End in 1926, is completed. June, The city council purchases the New Brighton estate for £17,500 for industrial development. 5 August, New administrative buildings open in New Brighton. 16 September, The foundation stone for a new coloured school in Fairview is laid. Lights are switched on in New Brighton. April, New school buildings for the Kshatriya Gujerati Mochi Mandal at the corner of Hartman Road and Smith Street are completed. The school is started in 1924 when it uses as its premises a house at the corner of Upper Hill Street and Leather Lane. The Gujerati community in Port Elizabeth is though to have started in the 1890s, and is supplemented in 1899 when neutral residents of Johannesburg flee the Transvaal. The Aryan Cricket Club is started by members of the Gujerati community. 1 May, Boundaries of Port Elizabeth are extended to include Korsten, Swartkops Village, Deal Party Estate, Fairview Township and Winterstrand. 8 May, A meeting is held in the Feathermarket Hall to protest the persecution of Jews in Germany. 14 September, The new Firestone factory comes on line. A separate plant is opened in Uitenhage on 16 June 1947. December, Stop signs are introduced. 2 March, New Brighton Library opens as a result of the joint efforts of the local European/Bantu joint council. In May 1939 it is reported to have 11000 books in stock. 6 November, The thousandth sub, economic house is delivered for occupation in Holland Park by the municipality. 21 November, Work begins on a planned 3000 houses in New Brighton under a municipal 5, year plan with money borrowed from the central government. 22 December, Plan is approved for the housing of indigent aged at Gypsumville, Korsten and New Brighton. January, Following research by Eric Axelson, Kwaaihoek is proclaimed as the site of Diaz’ padrão [stone cross]. Fragments of this cross are discovered in a pool and after reconstruction are moved to the University of the Witwatersrand where they reside to the present day. 23 March, Bubonic plague breaks out in Port Elizabeth. By 30 June 21 cases have been reported, of which 19 had died. 22 April, Foundation stone is laid for the new Saraswathi Educational Institute in Rudolph Street to provide for the educational, social and religious needs of Indians in Port Elizabeth. June, Cadbury Fry’s factory is completed in Harrower Road. 13 July, C.K Pillay forms a troop of boy scouts. September, Flower sellers in Port Elizabeth come under the control of the Traffic Department. As a result they are moved from Baakens and Kort Streets to a permanent stand in Donkin Street. September, The city’s first automated traffic signal is erected at the intersection of Russell Road and Main Street. 9 September, A replica of a Voortrekker wagon passes through Port Elizabeth as part of the centenary celebrations of the Great Trek. 1 February, Municipality resolves to build a Power Station at Swartkops, but by 1940 ratepayers have still to ratify permission to purchase the land. 5 March, New Brighton Presbyterian Church is opened. 20 April, The cooperative trading movement is formed at a meeting in New Brighton presided over by Dr JWWW Jabavu. 3 September, Britain declares war on Germany and South Africa follows suit on 6 September. 7 February, The city council donates a 33 acre site at the junction of Stamford Road on the Papenkuils River for a new hospital for Black residents. The Livingstone Hospital is opened in October 1955. 1 July, At a meeting in the Feathermarket Hall, the reunited National Party calls upon the government to surrender to Germany. At a subsequent meeting, Port Elizabeth citizens affirm their support of the Smuts government. 1 May, Baking of white bread is suspended, and only permitted again on 1 November 1948. Consecration of re, erected Shri Mariamman Aulayam shrine in Gardner Street, South End takes place.Plans for the temple and a school room had previously been passed in October 1934. 6 December, Fighting breaks out in Main Street between Union servicemen and pro, Nazi supporters. August, Dr Ernest Theophilus Dietrich is elected to represent Ward 1 on the City Council, the first Coloured person to be elected to office in Port Elizabeth. 23 September, Foundation stones are laid for two new schools in Schauder Township. In addition, between 1940 and 1945, the School Board establishes the Pendla, Kama, Molefe and Newell schools in New Brighton. 29 December, A gathering is held at the City Hall to mark a world, wide Jewish day of mourning for the victims of Nazi brutality. June, The Avalon Theatre opens in Korsten for Coloured and Indian residents. July, Mahomed Moosa Desai is elected to the City Council. 28 July, Meeting of the newly formed Workers’ Civic League is held in the City Hall. This is attended by trade unionists and workers. 29 July, Liberty cavalcade is organized to raise funds for the war effort. It is visited by more than 100 000 people and raises GBP 65 000. 17 August, The Assumption Convent opens in Schauder Township. November, The School Board is authorized to establish a primary school for Chinese children. This is already in existence in the Moi Yean Association’s building in Queen Street. January, Building of a crèche begins in New Brighton. Plans to increase house rentals in New Brighton bring about protests from its residents. 8 May, Victory in Europe Day celebrated. Victory over Japan (VJ Day) is celebrated on 14 August. 24 August , The first sod is turned on the new General Motors plant. This is opened in 1948. December, Houses in Steytler Township are ready for handover to ex, servicemen. Parliament passes the Union Group Areas Act. The first zoning of Port Elizabeth under the Group Areas Act takes place. University of Port Elizabeth is founded. The Kempston Road Free Trade Area is established. The Central Business District (CBD) is opened to all races.